The war of words between Russia and Turkey over the downing of a Russian warplane continued Friday, with Turkish President Recep Tayyip Erdogan warning Moscow not to "play with fire." During a speech in the northeastern Turkish city of Bayburt, Erdogan accused Russia of "playing with fire" by attacking groups opposed to Syrian President Bashar al-Assad "under the pretext" of fighting the Islamic State group, and by "irresponsibly" targeting trucks operating inside Syria for "commercial activities or humanitarian aid." Turkey's state-run news agency and a Turkish relief group reported Wednesday that Russian aircraft attacked a Turkish aid convoy inside Syria near the Turkish border, killing seven people and wounding 10. Russia reacted angrily after Turkish fighter jets shot down the warplane Tuesday, threatening ties between two countries on opposite sides in the Syrian war and raising fears of a wider international conflict. Turkish President Recep Tayyip Erdogan addresses local administrators at his palace in Ankara, Turkey, Nov. 26, 2015. 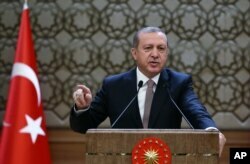 In his comments Friday, Erdogan was apparently responding to Russian President Vladimir Putin, who a day earlier, in an apparent reference to Turkey, had said that those who conduct "criminal business" with terrorists and use them "to achieve their political goals" are "playing with fire." Erdogan also accused Russia of using the downing of the jet as an excuse to level "unacceptable accusations" against Turkey. He called Russian charges that Turkey was buying oil from the Islamic State group "slander." "You must know that we are not as dishonorable as to buy oil from a terrorist organization," the Turkish president said. "Turkey is buying oil from Russia." Still, Erdogan said he wanted to meet with Putin "face to face" Monday on the sidelines of the climate summit in Paris. Putin has not responded to the Turkish leader's overtures, with Kremlin foreign policy adviser Yury Ushakov on Friday citing "a lack of readiness from the Turkish side to offer an elementary apology for the incident with the aircraft." Russian President Vladimir Putin and French President Francois Hollande attend news conference after meeting at Kremlin, Moscow, November 26, 2015. Also Friday, Russian Foreign Minister Sergei Lavrov announced the cancellation of visa-free travel between the two countries, stating that Turkey's government had "crossed the line of what’s acceptable." Turkish Prime Minister Ahmet Davutoglu took a more conciliatory tone in an opinion piece published Friday in Britain's The Times newspaper. "While the measures to defend our territory will remain in place, Turkey will work with Russia and our allies to calm tensions," he wrote. Davutoglu said fighting Islamic State is the top priority. Earlier this week, Putin said the downing of the plane was an act of betrayal by a country Russia had thought of as a friendly state. He also said the United States knew the jet's flight path and should have informed Turkey, its NATO ally. However, two U.S. officials told Reuters on Friday, speaking on condition of anonymity, that Russia did not inform the U.S. military of its jet's flight plan.